I'm working on a project which requires certificate verification for executable files. I have created my own trusted root certificate store, and used openssl to perform verification. I have an executable file, lets call it test.exe. I also have the trusted certificate store that is provided with windows. Here is the screenshot of the store, before i right click to the file and go to the properties/digital signatures tab to inspect if the certificate is valid or not. It contains 26 Trusted Root Certificates and 3 Intermediate Certificates. Now, when i go to the properties/digital signatures tab, and inspect the signature, it says the certificate is valid and trusted. 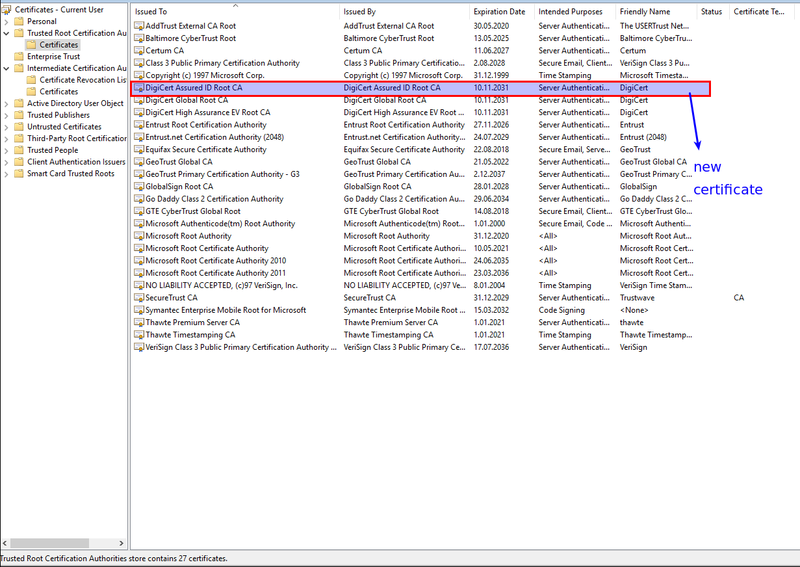 Windows cert verifier tool downloaded 2 certificates (1 root 1 intermediate) by looking the original cerfificate's AIA (Authority Information Access) field, and added both of them to the trust store. What didn't make sense to me was, how did the cert verifier tool decide whether or not it can trust the root certificate (DigiCert Assured ID Root CA) that it just downloaded from AIA field? Because, it seems to me that the verifier trusted the new root certificate that the system doesn't have in it's trusted certificate store. How can this process be explained? The Windows trust store currently contains some 340 root CAs. But AFAIK not all of them will be installed/visible on your machine right away. And Windows has a somewhat counterintuitive feature where during certificate path construction when the path ends in an unknown root CA Windows will go online and check if it needs to download one of those 340 roots. 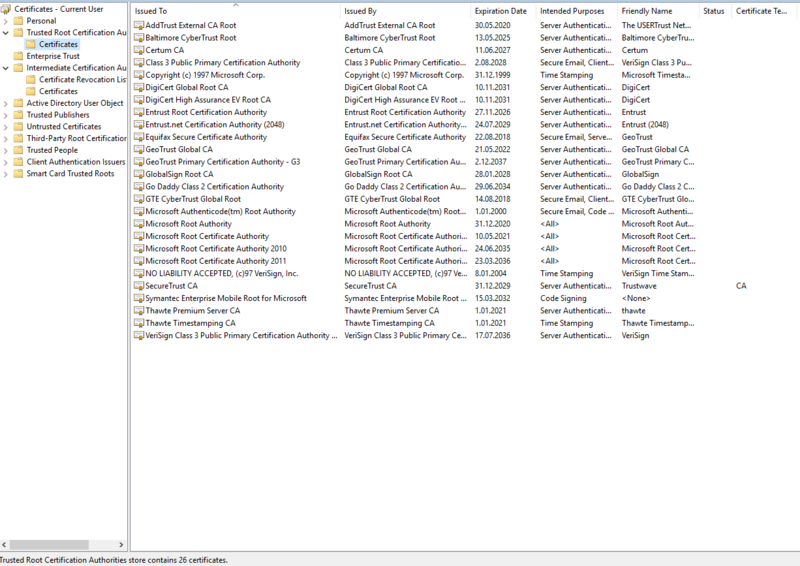 Related question: How much of a problem is it that Windows "hides" some of the trusted root CA certs? Not the answer you're looking for? Browse other questions tagged certificates certificate-authority openssl or ask your own question.